Models include uni-directional flow, PTF threads, knob adjustment, relieving diaphragm, 5 to 150 psig outlet pressure adjustment range, with gauge. 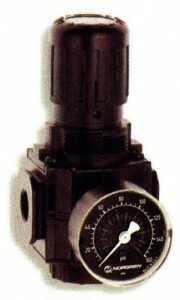 Operating Pressure 300 max. p.s.i. Operating Temperature -30 to 175 deg f.